We recently came across a great article about sleeping at Healthy Holistic Living (HHL), and wanted to archive it on our website alongside a few that we’ve already posted on this subject. Sleep is still somewhat of an enigma in the scientific world – from the correct way to sleep to why we need it, the study of sleep still has a long way to go before we fully understand its intricacies. As HHL points out, approximately 85% of all mammalian species sleep more than once a day, and scientists are not completely clear if humans are naturally monophasic as opposed to polyphasic. Has modern society conditioned us to be so, just as it has influenced so many other aspects of our health? If we examine the topic from a historical perspective, the work of historian Roger Ekirch of Virginia Tech is a good start. In 2001 he published a paper that included over 15 years of research. It cited an overwhelming amount of historical evidence which reveals that humans used to in fact sleep in two separate blocks of time. You can read more about that (and access the paper) here. Regardless of our historical sleep habits, however, it’s quite clear that many human beings suffer from a lack of sleep for various reasons, one of which very well may be that we don’t take time out during the day to have a nap. Various studies have clearly outlined the many health benefits associated with napping. 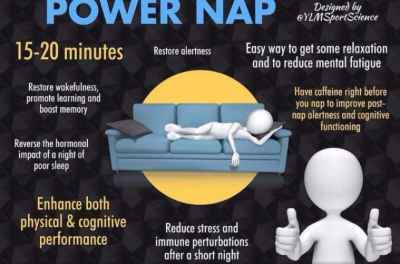 For example, a 2008 study showed that naps are better than caffeine for improving verbal memory, motor skills, and perceptual learning. In a study carried out in Greece, researchers found that adult males who took an afternoon nap at least three times per week were 37% less likely to die from a heart related disease compared to men who never take a short afternoon nap. The health benefits of napping are clear and substantial. You can find out more of those benefits from the HHL post here. Below is a great TEDx talk by Dr. Sara Mednick, Assistant Professor in the Department of Psychology at the University of California, Riverside. Her work on sleep research continues to shape the way we understand the importance of healthy sleep hygiene. In her talk, she argues for everyone to take a break.